Drawing, the representation or delineation of objects, either as they appear to the eye, or as projected on assumed planes, or as designated by conventional signs having a certain similarity to the appearance of the objects themselves. The painter, with free hand, draws or sketches objects in their visible and natural forms; the mechanical or architectural draughtsman projects, according to certain established rules and principles, objects existing or designed; while from the notes of the surveyor the topographical draughtsman plots the surface of a field or locality, with its natural and artificial objects represented somewhat as they would appear projected on a transparent plane above them, but with certain conventionalities to express more definitely certain features. Architectural and mechanical drawing is in general the delineation of objects by geometric or orthographic projection. Since the surfaces of all bodies may be considered to be composed of points, the first step is to represent the position of a point in space, by referring it to planes whose position is established. In general these planes are assumed at right angles to each other (fig. 1), and the points projected upon them make up the drawings of the plan, end and side elevation. Let a brick be held flatwise in the corner of a rectangular box, with its sides parallel to the various sides of the box; if now from the several corners of the brick perpendiculars be let fall upon the adjacent sides, the points thus found will be the orthographic projections of the corners; and if these points be connected by corresponding lines, there will be outlines of the brick under three views or projections: on the bottom of the box, a rectangle 8 by 4 in., being the plan of the brick; on one side, a rectangle 8 by 2 1/2 in., the side elevation; on the other side, a rectangle 4 by 2 1/2 in., the end elevation. If the brick be inclined to either or all of the sides of the box, the projected outlines will be varied; but the same rule for determining the position of points obtains, viz. 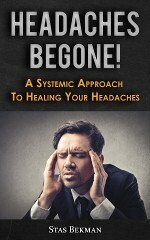 : by letting fall perpendiculars on the planes to which they are referred. The orthographic projection of any object in outline is the shadow it would cast on a plane perpendicular to the rays of the sun, if held between it and the sun. 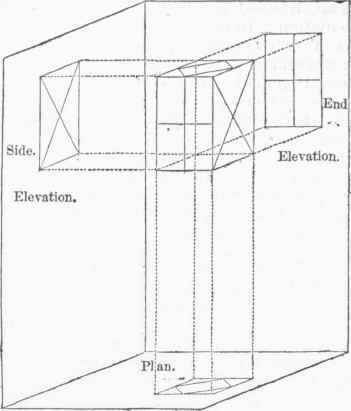 Simple objects in general may be defined by two views, a plan and elevation; but often, to illustrate the construction of the interior, sections are necessary, that is, the appearances that might be presented were the objects cut by planes; all portions that would be thus absolutely cut are designated by filling up the outline with a quantity of inclined parallel straight lines, at equal intervals from each other; should there be distinct parts in section, in contact with each other, to prevent confusion the different sections are expressed by lines inclined in opposite directions. In most architectural and mechanical constructions it would be obviously impossible that they could be drawn full size. Scales are therefore made use of in which fractional parts represent wholes. The scale in most common use in architectural drawings is that of one fourth of an inch to the foot, or 1/48 of the lineal dimensions; in mechanical drawings, one fourth or one eighth full size, that is, as usually understood, one fourth or one eighth of the lineal dimensions. Working drawings of machines, or those intended to be used in construction, are generally laid off to as large a scale as possible; they are mostly outline drawings, consisting of lines to indicate the form of the object represented. The roundness, fulness, or obliquity of the individual surfaces is not indicated by the lines, although it may be generally inferred from the relation of the different views of the same part. The direct significance of an outline drawing is often considerably increased by strengthening those lines which indicate the contours of surfaces resting in the shadow. That all parts may be shade-lined according to one uniform rule, the light is supposed to fall upon the object obliquely at an angle of 45° (that the horizontal and vertical lines may be relieved equally), and in general (fig. 2) to fall from the upper left-hand corner of the paper diagonally; and the same rule is followed in the more finished drawings where both shade and shadow are introduced. As a means of avoiding the indefi-niteness presented by mere outline, recourse is frequently had to the shading of the parts of a machine or edifice, which is usually done with color and a brush. In architectural drawings, a complete picture is often attempted with all the appliances of shade and shadow, intended to show the artistic effect of the construction. Color is introduced in both mechanical and architectural drawings, to show the material of which the construction is composed; and it is usual to imitate somewhat the natural color of the substances. - Besides orthographic projection, architects, for the representation both of exterior and interior of edifices, often make use of perspective; and mechanical draughtsmen, for the better understanding of the parts of a machine than by separate plans and elevations, unite them by the rules of isometrical drawing. The science of perspective is the representation by geometrical rules, on a plane surface, of objects as they appear to the eye from an assumed point of view. 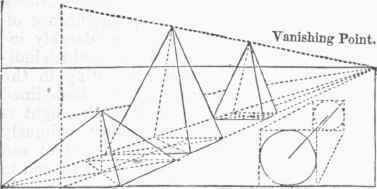 All the points of the surface of a body are visible by means of luminous rays proceeding from these points to the eye, forming a cone of rays. The intersection of these rays by an intervening transparent' plane is the perspective projection of these points, the rules for the projection of which mechanically are simple and well established. The supposed transparent plane is called the plane of projection or plane of the picture. The horizon of the picture is the horizontal line resulting from the intersection of the plane of the picture by a horizontal plane passing through the eye. Point of view or point of sight is the point where the eye is supposed to be placed. Vanishing points are points in a picture to which all lines converge that in the object are parallel to each other. An object is said to be in parallel perspective when one of its sides is parallel to the plane of the picture (fig. 3); in angular perspective when none of its sides are so. Isometrical drawing implies that the measures of the representations of the lines forming the sides of each face are equal. The principle of isometrical projection consists in selecting for the plane of the projection one equally inclined to three principal axes at right angles to each other, so that all straight lines coincident or parallel to these axes are drawn in projection to the same scale. To draw a cube in isometrical projection (fig. 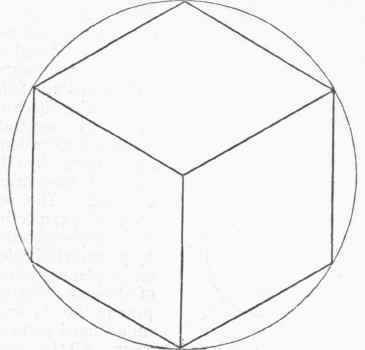 4), with a radius equal to one side of the cube, describe a circle, inscribe a regular hexagon, and draw lines from alternate angles to the centre; the hexagon will be divided into three parallelograms, each of which will represent a face of the cube; all the lines will be equal, and equal to the side of the cube. On these lines can be set off distances as in orthographic projection, but only upon these lines, or those parallel thereto. Curved or inclined lines are therefore to be established by reference to these lines, and not by direct measure of the lines themselves. Isometrical drawing is especially valuable to the mechanical draughtsman, as it embraces the applicability of a scale with pictorial representation. In drawings for the patent office it is of very general application. - Topographical drawing is the delineation of the surface of a locality (fig. 5), with the natural and artificial objects, as houses, roads, rivers, hills, etc, upon it, in their relative dimensions and positions; giving in miniature a copy of the field, farm, district, etc, as it would be seen by the eye moving over it. Many of the objects thus to be represented can be defined by regular and mathematical lines, but many other objects, from their irregularity of outline and their insignificance in extent, would be very difficult to distinguish. Certain signs have therefore been adopted into general use among draughtsmen, some of which resemble in some degree the objects for which they stand, while others are purely conventional. 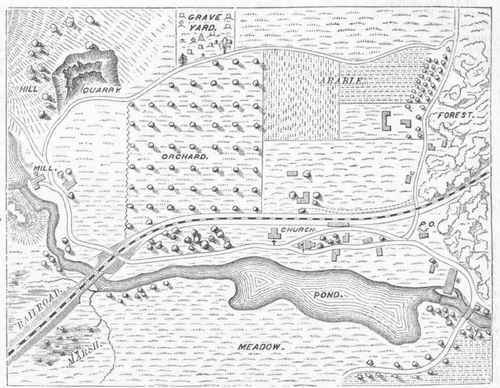 Sand is represented by fine dots, gravel by coarser dots; meadow or grass land is represented by tufts of little perpendicular lines; trees, although not consonant with the other parts of the plan, are represented often in elevation, at other times by clumps of foliage in plan, sometimes distinctive in their foliage; dwellings and edifices usually in plan, made distinctive by some small prefix, as a pair of scales for a court house, a sign post for a tavern, a horse shoe for a smithy, a church with a cross or steeple, etc. The localities of mines are represented by the signs of the planets which were anciently associated with various metals, and a black circle or dot for coal. Hills are represented by two methods, the vertical and the horizontal. In the first the strokes of the pen follow the course the water would take in running down the slopes, the strokes being made heavier the steeper the inclination; and systems have been proposed and used by which the inclination is defined by the comparative thickness of the line and the intervening spaces. In the system proposed for the United States coast survey, slopes of 75° are represented by a proportion of black to white of 9 to 2, and so down by nine grades to a slope of 2 1/2°, in which the proportion is 1 black to 10 white. By the horizontal method, or by contours, hills are represented by horizontal lines traced round them, such as would be shown on the ground by water rising by equal vertical stages. The choice of a scale for a plot depends in a great measure on the purpose for which the plan is intended. Plans of house lots are usually named as being so many feet to the inch, plots of surveys so many chains to the inch, maps or surveys of states so many miles to the inch, and maps of railway surveys as so many feet to the inch, or so many inches to the mile. In the coast survey all 'the scales are expressed fractionally and decimally. The scales of small harbor charts vary from 1 : 5,000 to 1 : 60,000; that of charts of bays and sounds is usually 1 to 80,000, of general coast charts 1 to 400,000. In the United States engineer service the following scales are prescribed: general plans of building, 1 : 120; maps of ground with horizontal curves, 1 : 600; topographical maps comprising 1 1/2 mile square, 1 m. to 2 ft., or 1 : 2,640; 3 miles square, 1 : 5,280; between 4 and 8 miles, 1 : 10,560; 9 miles square, 1 : 15,840; not exceeding 24 miles square, 1: 31,680; 50 miles square, 1: 63,360; 100 miles square, 1:126,720; surveys of roads and canals, 1 : 600. In the plotting of sections, as of railway cuttings, a horizontal or base line is drawn, on which are laid off the stations or distances at which levels have been taken; at these points perpendiculars or ordinates are erected, and upon them are marked the heights of ground above base, and the marks are joined by straight lines. To express rock in a cut, it is generally represented by parallel inclined lines; rivers by horizontal lines, or better colored in blue; the depth of sounding in a mud bottom by a mass of dots. Since it would be in general impossible to express the variations of the surface of the ground in the same scale as that adopted for the plan, it is usual to make the vertical scale larger than that of the horizontal lines in the proportion of 10 or 20 to 1. - Topographical features are represented as effectively by the brush and water colors as by the pen. Colors are used conventionally. Thus, in the practice of the French military engineers, woods are represented by yellow gamboge with a very little indigo; grass land green, gamboge and indigo; cultivated land brown, lake, gamboge, and a little India ink or burnt sienna, adjoining fields being slightly varied in tint; gardens, by patches of green and brown; uncultivated land, marbled green and light brown; brush, brambles, etc, marbled green and yellow; vineyards, purple; sands, a light brown; lakes and rivers, a light blue; seas, a dark blue, with a little yellow added; roads, brown; hills, greenish brown. In addition to the conventional colors, a sort of imitation of the conventional signs already explained is introduced with the brush, and shadows are almost invariably introduced. Topographical drawings receive the light, the same as architectural and mechanical drawings, from the upper left-hand corner. Hills are shaded, not as they would appear in nature, but on the conventional system of making the slopes darker in proportion to their steepness, the summit of the highest ranges being left white. Topographical drawings embrace but a small portion of surface, and are therefore plotted directly from measures; but in geographical maps, embracing at times a great extent of country, various projections are made use of to express as nearly as possible a spherical surface upon a plane. These species of projection are generally included under the head of mapping.